My final Hawaii food post - only because I feel obligated to write about every place we ate, especially if I have photos. 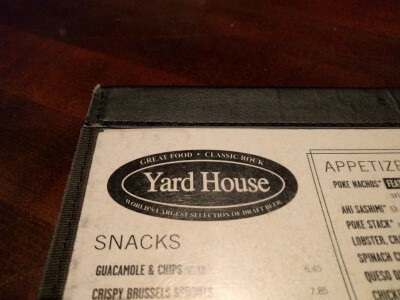 For dinner on our first full day in HI, we went to a chain restaurant: Yard House. I'd been to one in Las Vegas and remembered it being fine. We did make a reservation, probably a good thing because around 6 pm it was very crowded with a lot of people waiting for a table. Even with a reservation we had to wait a bit. We were seated in a gigantic booth. I wasn't too thrilled because a booth is never terribly convenient for someone in a wheelchair and also because it was big enough for 6-8 people and it was just the two of us. 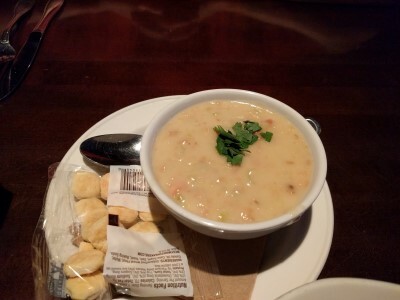 SP's Clam Chowder (New England style, chopped clams, potatoes). 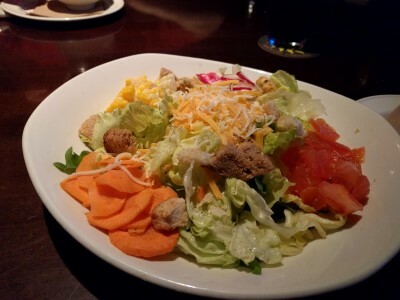 My Classic Ranch Salad (iceberg & Boston lettuce, tomatoes, carrots, sweet corn, jack, cheddar, croutons, buttermilk ranch). I'm not a fan of corn so SP ate it. SP's Tacos: a Baja fish taco (cabbage, cilantro, pico de gallo, guacamole, sriracha aïoli) in a regular taco shell and a Carnitas taco (roast pork, grilled onions, pico de gallo, guacamole, pineapple) in a vampire shell. 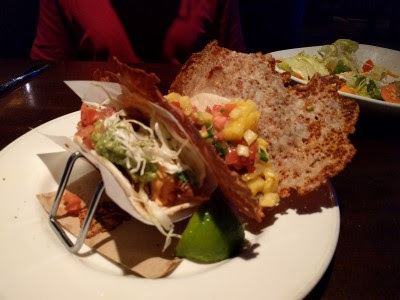 "Vampire Style" is a taco wrapped in a grilled, crispy cheese-crusted flour tortilla shell. He said they were good. 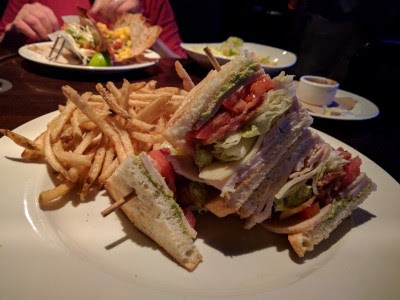 My Roasted Turkey Club (Swiss, crushed avocado, bacon, tomato, lettuce, mayo, toasted sourdough, fries). Our food was fine, nothing great, large portions (well, mine) and for the Waikiki area, not too expensive. Lots of beer choices. Our server was terrific. I just left feeling rather let down and I'm not sure why because I don't have anything bad to say.